When the temperature rises, getting an effective household fan is an easy way to stay cool without overheating your energy bill. Fans typically cost only pennies a day to run, and you can move them from room to room instead of cranking up your entire home’s air conditioning. There are several types of fans, so choose the one that will suit your room and needs the best. A powerful floor fan is usually most effective at moving the greatest amount of air in larger spaces, but anyone who needs to save space may want to look into a tower fan with a smaller footprint. Tabletop and desk fans will have plenty of power for a smaller bedroom or office, while window and box fans can help inject a blast of fresh outdoor air on a cool night. Don’t forget to consider how much noise you can tolerate. All fans will produce white noise, but you shouldn’t have to put up with any squeaking, grinding or clunking. Here are our picks for the best fans, whatever your budget or lifestyle. A simple fan that can cool off a large space with ease, the Vornado 660 Whole Room Air Circulator moves air up to 100 feet. It also gets plenty of praise from reviewers for quality construction and ease of use, which they say help justify the premium price. Owners say the four-speed Vornado 660 is ideal for keeping air circulating in a medium-size room. It can be adjusted via a chrome glide to tilt up or down, and while you won’t get a remote control or oscillation, most say the fan circulates air so well that it makes those features unnecessary. The top-mounted push-button controls couldn’t be simpler: There’s an on/off button and a button for each speed. Testers with The Sweethome say it’s easy to clean the fan’s grates and propeller after popping just a few screws off the housing. It also gets solid marks for noise, with owners saying it’s fairly quiet on the two lowest settings. The Vornado 660 comes in black or white, both of which have a sleek, glossy finish that will complement most décor styles. It isn’t the smallest fan at 12 by 13.5 by 15 inches, but since it’s low to the ground, it isn’t as noticeable as a more traditional stand fan. 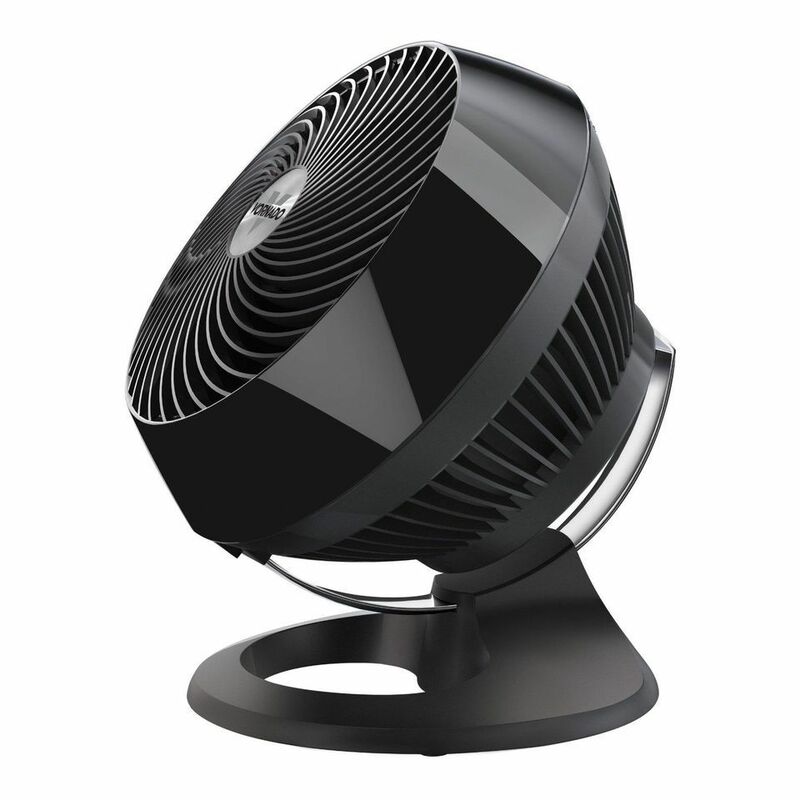 Reviewers say the fan feels sturdy and stable, and Vornado backs the fan with a long five-year warranty. Tower fans are meant to move a lot of air without hogging floor space, and reviewers say the Seville Classics UltraSlimline Tower Fan does just that. In fact, reviewers noted that it circulated more air than any other fan, and is powerful enough to cool off a large living room. The UltraSlimline doesn’t skimp on features. It has four speeds, including an energy-saving setting, and there’s a timer that can automatically shut the fan off after 30-minute chunks of time up to 7 ½ hours. Like most tower fans, it oscillates and includes a long-range remote control. For the most part, reviewers say the fan is quiet, but a few report problems with clicking or squeaking, especially in oscillation mode. The 40-inch tall UltraSlimline has black plastic housing and a steel grill, and it should be unobtrusive and compact in most corners. It’s also more tip-resistant than other tower fans, testers say. The fan has a one-year warranty. Interested in reading more reviews? Take a look at our selection of the best tower fans. If you like the sound of the Vornado 660 Whole Room Fan but can’t stomach the price, the Honeywell HT-900 TurboForce is a good budget stand-in. Though it’s smaller and a bit less powerful than the Vornado, it’s still effective enough to move air in a small to medium room, reviewers say. Like the Vornado, the HT-900 has a relatively simple design. There are three speeds that users can select with a simple dial, though a few owners say the dial’s placement in the rear of the fan is awkward. The fan pivots up and down up to 90 degrees. It does not oscillate or have a remote, but it can be used on a table or mounted on a wall for better air flow. Available with black or white housing, the HT-900 looks similar to the Vornado from a distance, but the plastic isn't of the same quality level, keep that in mind if you have children or pets as the plastic on the grill will be easier to bend. The fan is about 11 x 6.5 x 11 inches, and it has a one-year warranty. Traditional box fans have enduring appeal because of their versatility: while they can be placed on the floor, they can also sit in a window to draw in fresh air from outside. The Holmes 20-inch Box Fan earns praise for this reason, as well as for simplicity and durability. The Holmes box fan has three speeds that users select using a simple dial, plus detachable feet to help keep the fan from tipping over when it’s on the floor. Though box fans aren’t exactly quiet, this one doesn’t draw any unusual complaints. Some reviewers do grouse about the location of the speed dial, which is in the back center of the fan—many say it would be easier to use on top. On the bright side, they say the front grill is easy to remove for cleaning. Available in a clean white color, the Holmes box fan looks every bit like a traditional box fan, with a slightly rounded square frame. It’s also large, at about 21 x 21 inches. The fan has an integrated handle to make it easier to carry and a cord wrap for neater storage. It’s backed by a one-year warranty. An efficient window fan that can circulate air easily in a large room, the Holmes Twin Window Fan with Comfort Control Thermostat is loaded with features that owners say make it a cheaper alternative to an air conditioner on cool nights. The Holmes window fan has three-speed settings and an easy-to-control dial thermostat. Owners love being able to switch the fan blades to draw in air from outside, expel it from inside, or do both at once. Each fan can be operated independently, too, which reviewers appreciate. Some complain the fan is a bit noisy at higher speeds, but many others say it’s quiet enough for a bedroom window. They also like that there are no overly bright LED controls to disturb light sleepers. The Holmes window fan comes with a screen that expands to fit windows up to 35 inches wide. The fan itself is about 25 inches wide and 12 inches tall. Like most window fans, it has white housing meant to blend with white window frames. The motor is water-resistant, and there is a three-year limited warranty. Buying a simple room fan doesn’t mean you have to sacrifice on looks and style. Yes, most desktop and vertical fans look plain and cheap, but there are a few options out there that will enhance the overall interior decor instead of detracting from it. Adding a mix of high-quality materials and modern elegance, the right fan can even act as an accessory piece or focal point in any room. Featuring an elegant, curvy design with an eye on functionality, the Lasko 4910 Desktop Fan is a great way to add some air circulation at table height. The fan features a dual duct design where the air is forced out of two apertures for double coverage. Controls are located at the base of the unit so you can control the three-speed settings from a central, easy-to-access location. For extra coverage, the top duct also oscillates. Buyers who just want a little bit of a breeze while they work should check out the Vornado Zippi Personal Fan, which owners say is the perfect desk companion: powerful, quiet and compact. Zippi comes in five colors—black, white, pink, blue and green—and measures 6 x 4.5 x 5.5 inches so it won’t take up too much valuable desk space. One of Zippi’s standout features is its soft-touch nylon blades, which won’t hurt anyone who touches them while the fan is on. Zippi also has a foldable frame that makes it easy to take on a business trip or simply tote from home to work. There are two fan speeds, and the fan head easily adjusts to direct air where users need it. Reviewers are happy to report that Zippi is very quiet, even on high, so it won’t be a distraction during long work sessions. They also say it creates a great breeze for desktop use—enough to cool you down, but not so much that it’s overpowering. There are some reports of the Zippi failing to work after a short time; however, the fan is backed by a three-year warranty. Our reviewers spent 21 hours testing one of the most popular fans available. To really get the full experience, our testers tried it in different rooms in their houses, morning and night. We also asked them to consider the most important features when using this fan, including its cooling power and oscillation. We've outlined what matters most here so that you, too, know what to look for when shopping. Type There are several types of fans, so choose the one that’ll suit your room best. A powerful floor fan is usually most effective at moving the greatest amount of air in larger spaces, but anyone who needs to save space may want to look into a tower fan with a smaller footprint. Tabletop and desk fans will have plenty of power for a smaller bedroom or office, while window and box fans can help inject a blast of fresh outdoor air on a cool night. Cooling power CFM — or cubic feet per minute — is used to measure the amount of air a fan moves every 60 seconds. CFM is generally dependent on the fan’s motor and blades (their pitch, length, and shape). The higher the CFM, the more air a fan will circulate. Fans with low CFMs are only suitable for small spaces. Oscillation﻿ Some fans operate from a single position and others oscillate (or rotate) as they circulate air. An oscillating fan is more effective at cooling since it’s better equipped to move air throughout the entire room. If you’d like your fan to focus on one spot — say, to dry a wet spot on a carpet — this feature isn’t necessary.